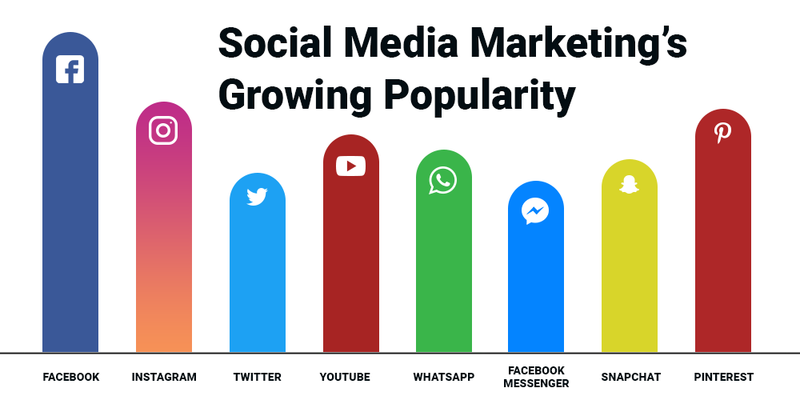 Social Media Marketing’s Growing Popularity - Silex Softwares Pvt. Ltd.
One of the major reasons why FB, Instagram, Twitter, and other social media platforms are so popular is that they give voice to individuals. Earlier, celebrities, politicians were the only one to get exposure in the media but today, with the help of various social media platforms – everyone has the freedom to present themselves, their ideas and opinions in a quick and efficient way. To the ones you connect on social media, they maybe your friends, family, business peers, or anyone with whom you want to be friends with. This is the right place to establish your identity, portraying professional expertise, sharing interests and ideas. Regardless of the fact if you have a small or large-scale business, SMM plays a very important role. It increases awareness regarding your brand, boosts leads as well as sales. Today, with more than three billion people using social media platforms, it is not a passing trend. 6 reasons why you should consider social media marketing and why it is a wise business move for the growth of your brand. People should be aware about your business only then they can buy your products and services. Boosting your ability across potential customers, allowing you to reach out to a wider audience with the help of time and effort are few of the pros. Today, you can create a free social profile on any platform. Customers are savvier and discerning regarding the type of brand that they support. It is always good to look for ways that best matches your profile. Go ahead and set a robust profile that is being updated with informational and relevant content. This helps to give a positive impression making your business look trustworthy, knowledgeable, and approachable. Display your expertise, discounts, offers, and values to establish confidence amongst your customers. Social media platforms also help you to get connected with people across the globe. Customers don’t simply want social media posts. Your brand’s personality should shine through everything that you share with the help of social media. It should represent you in the best manner. Make sure the tone goes right whether it is friendly, formal, informal, or any. Evaluate who you are and what you should be. Customers always want to see the real you behind the social media profiles. Social channels keep evolving ever now and then and this continuously changing environment can be intimidating for some. Don’t push yourself too much. Rather, play with the new ways to get connected with the audience and give permission to yourself on the go. Create engaging social media content with the help of a simple setup. Over the time, you will keep getting better ideas as per your follower’s preferences. Various social media channels have managed to break down barriers between businesses and their customers. Now, rather than giving a call on the toll free number, many people head towards Facebook or Twitter to contact the authorities and get the required information or help. Marketing cost adds up and many business owners can’t afford huge campaigns. Get the best value for the social media advertising. Your business no matter what size it is has the power to grow your audience and engage them. Social media is a very important part of your business marketing, but it not a cake walk to run it effectively for everyone. Take the first step on the ladder of success, by hiring a proficient SMM expert to get engaged with your potential customers for best ROI.